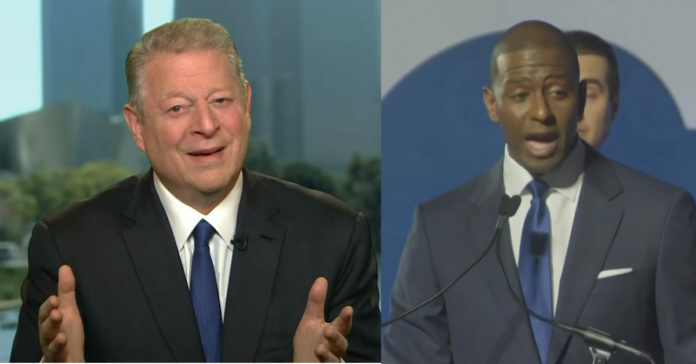 Andrew Gillum is about to pull an Al Gore, he all but did when he released a statement hinting that he will soon retract his concession, just like the hapless and eventual loser Al Gore did and fight it out with a doomed recount. Unlike Al Gore, Gillum and Bill Nelson (also gunning for a recount) actually let the law go into effect which mandates a recall if the race has a winning margin of 0.5%. Right now, with votes to count, both races seems destined for more Florida chaos. Gillum, unlike Nelson, did concede to his opponent. “On Tuesday night, the Gillum for Governor campaign operated with the best information available about the number of outstanding ballots left to count,” the statement read. From The Orlando Sentinel: The Florida governor’s race is heading to a machine recount and the U.S. Senate race will face a lengthier manual recount after returns from Broward County on Thursday pushed Democrats Andrew Gillum and U.S. Sen. Bill Nelson closer to their Republican opponents Ron DeSantis and Gov. Rick Scott. At the same time, Democrat Nikki Fried took the lead over Republican Matt Caldwell by 575 votes in the race for agriculture commissioner, which is also headed to a manual recount. Gillum trailed DeSantis by less than 39,000 votes, or 0.47 percentage points. A recount is automatically triggered if the margin drops below 0.5 points. In the Senate race, Nelson trailed Scott by about 17,000 votes, a margin of 0.22 points. A hand recount of ballots, longer and more thorough than a machine recount, is triggered if the margin falls below 0.25 points. “I think it’s fair to say right now the results of the 2018 Senate election are unknown, and [media] and elections officials should treat it as such,” Elias said, adding anyone who cast a provisional ballot should confirm their votes with their county elections office.